Hi! I have a NEW FoodSaver food preservation system for sale. Included I have the original box (containing the original packaging material), all the original documentation (manual/recipe books, accessories pamphlet, tips sheet), the original instructional stickers still on the outside and inside of the sealer, and the items in the Starter Kit (1 FoodSaver heat seal roll stored inside the machine, 5 FoodSaver heat & seal bags, 5 FreshSaver zipper bags, 1 wine stopper, 1 lunch/leftover container). Note: I neglected to photograph the items in the Starter Kit but I have them all and they have never been used. The FoodSaver measures 16"Lx 7"W x 7.5"H, is model #4800, and is stainless steel & black. In addition to the FoodSaver sealer, I also have a box of extra combo pack FoodSaver brand bags for sale. The box contains: 1 8-inch x 20-feet heat & seal roll (custom size bags), 4 11-inch x 16-feet heat & seal rolls (custom size bags), and 36 heat & seal precut bags (1 quart size). The rolls offer optimal convenience and flexibility with custom-sized bags that can be used to store anything from large roasts to small batches of cookies or even valuables such as silverware to prevent tarnishing while the pre-cut bags are ideal for small items, individual portions, or pantry goods. FoodSaver brand bags resists punctures and tearing, lock in freshness and flavour, and are safe for microwave/fridge/freezer/simmering. FoodSaver BPA-free bags have a unique multi-layer construction that creates an airtight barrier around foods. This FoodSaver sealer has never been used. 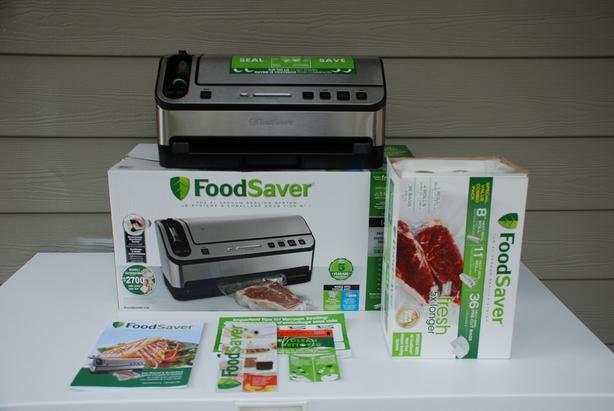 I will sell the FoodSaver sealer ($200) separately from the combo pack of FoodSaver bags ($50) but if any buyer wishes to purchase both, I will reduce my price from $250 to $230. I am located in Vancouver, BC but shipping is no problem. I will be happy to mail this FoodSaver to you using CanadaPost and Interac bank transfer. So, if you are interested in purchasing, e-mail me and we'll figure out the logistics and/or I can answer any questions you may have. Thanks!